As an aviation geek and armchair pilot, I wanted to have some fun with Tableau Public and my X-Plane Logbooks. Where have I flown the virtual skies in 2017? The answer isn’t too shocking, but there are some interesting patterns. Check out the image below and then head over to the live workbook. Where will 2018 take me? Not sure. Perhaps getting out of the western US would be a start. Maybe even a few international flights are in order. And, if you need some help with visualizing your data, check out my Tableau page at Spiral Analytics. Monitoring your Sales team performance is very important for the growth of your company whether it is an infant startup or a tenured enterprise. If your company is using a CRM solution, such as Salesforce.com or SugarCRM, you already have a wealth of data to leverage. The trick is to get the right level of actionable data in front of the stakeholders who need it to make a decision. The dashboard’s purpose below is to communicate the health of a sales team for a company based in Canada. The stakeholder required a view of sales by region and product category. In addition, they wanted visibility into product returns and profitability. 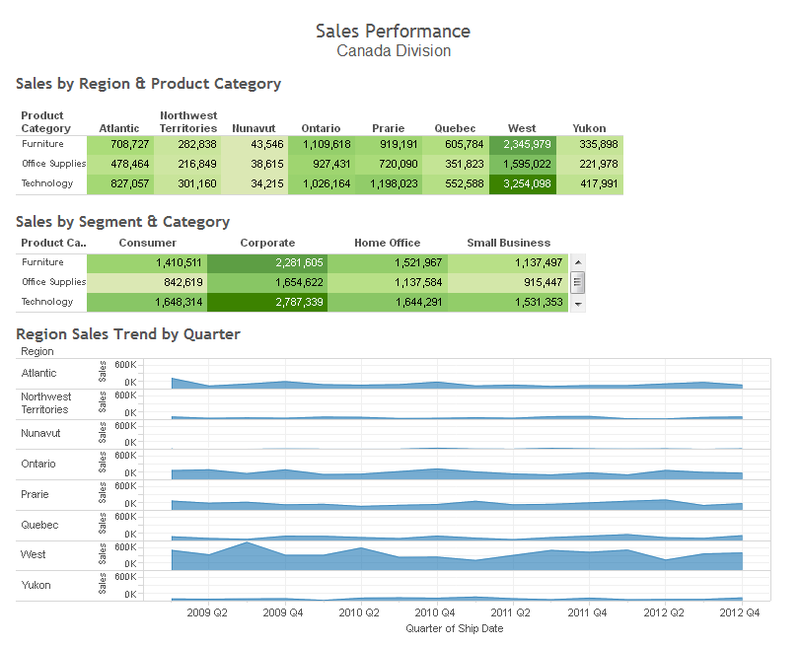 We used Tableau Public to create the dashboard below with a Canada Superstore data set available for free. So let’s dive into the dashboard and some of the insights it gives us. The first three charts on the dashboard illustrate which regions and product categories are driving the most gross revenue. The first heat map shows Product Category against Region with the darker green color indicating more revenue. The conclusion is the West drives the most revenue of the regions, with Nunavut bringing up the rear. However, technology sales are highest in the West, whereas other regions have a more equal distribution. The second heat map shows Customer Segment against Product Category. Corporate customers tend to drive the most revenue, with technology and furniture being the highest revenue generator. The lowest generator is Consumer Office Supplies.